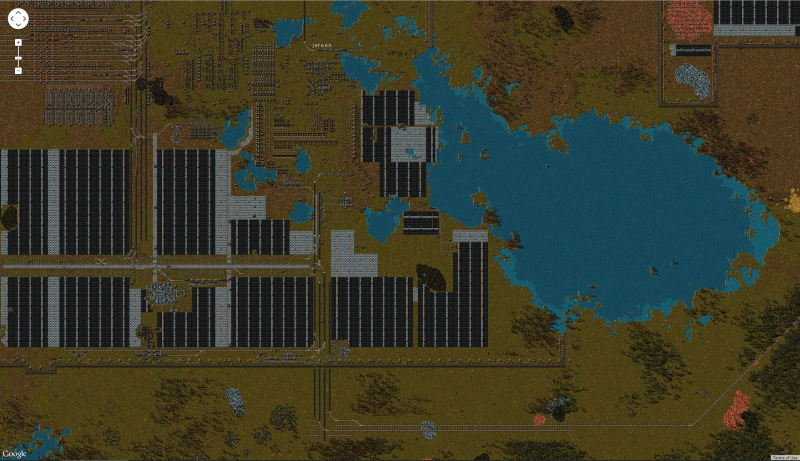 Description: This mod creates a Google Map of your Factorio game. It will create a local html file, nothing has to be uploaded for it to work. - Disabled on_load to fix Unknown key:"Error while running the on_load: __FactorioMaps__/Files/control.lue:363: attempt to index global 'game' (a nil value)"
- Added Narcs code: location in the browsers url bar, so you can link to a specific position on the map. - Fixed MP maps not working. - Fixed typoo with "Show Alt info"
- use "Midday" so your images are nice and light. - Click "Generate Images". This will start taking the screenshots, and generate an index.html in the script-output folder. Script-output is in the same folder as Saves. - For info on the advanced options, click Help. [Warning: on bigger maps it might take a while, and take up quite a bit of discspace. Last edited by jeroon on Fri Feb 26, 2016 5:13 pm, edited 13 times in total. My Map running on version 12.
mngrif found out the Alt info wasn't showing, fixed now in 0.5.2 . This is exactly how Maps "should" look like when pressing [ M } in game. /edit I looked, the code half uses game.players. the other half uses game.player. Search replaced game.player. with game.players. and it works now on my MP map. It's only usable in singleplayer. You can however now load a multiplayer map in singleplayer and make a map that way. So this is probably a bug in the mod and not a bug in Factorio, but the game crashed building the map. Not sure if it generated all the images or not (my guess would be it did) but the index.html was gone from the script-output directory. Not sure if the log file (attached) is enough information but not sure if it's possible to get anything more detailed. This is running 12.4 on Win7 x64, using the zip package, not the installer. Now i don't see anything weird there, except that you're using a dropbox folder. Can you try copying your entire factorio folder outside dropbox, and try again? I went ahead and included a version bump and packed it up as a tentative v0.5.6 -- grab it from https://github.com/narc0tiq/FactorioMap ... _0.5.6.zip. Everyone, be aware that I am not Jeroon and therefore this is not an official update. That said, if you're doing multiplayer the classic way (with all peers playing), this will let any player trigger the map generation instead of requiring player 1 to do it. Do remember that all players will perform the same operations, and also that since the map generating process is usually quite long, it will likely result in everyone disconnecting from everyone else. Thanks for the changes YPetremann, I've updated the first post. Note that I haven't tested it myself in a Multi Player game, it crashed my game when I tried to use it with 2 local clients, so use at own risk, backup your backups bladibla. As stated in the first post, you can always open your MP game in Single Player and use Factorio Maps that way. Great work on creating this useful helper. The ability to create and share map and coordinates has been a fantastic help in multiplayer games. A slight issue with the browser history made me look for a fix. Every move or zoom that changed the URL added a new history entry. PS: This can be used to patch already generated maps by directly editing the index.html file and just replace the update function. Last edited by HeilTec on Thu Sep 17, 2015 1:01 pm, edited 3 times in total. Google is my friend. Searching the forum and the wiki is always a first. HeilTec wrote: A slight issue with the browser history made me look for a fix. I hope for a bright future for this. I wonder if more parts of the API can be used? Man I love this mod! But how do you upload it to a website? And any suggestions on which sites? Updated to 0.5.8 due to changes in Factorio 0.12.11: game.on_init has become script.on_init and game.makefile is now game.write_file. Because of this changes the new version won't work for versions older than 0.12.11, I've attached the previous version (0.5.8) to this post. WARNING: The file attached to this post is the old version, new version is in the first post!